By now, you’ve likely heard of intermittent fasting, as it’s gained popularity both in the science and fitness communities. Thanks to all the research-based health benefits, intermittent fasting has become wildly popular for people trying to lose weight. If you’re interested in finding something that really works, then the 16/8 Method of intermittent fasting is a great place to start! What is the 16/8 Method (AKA Leangains)? One thing I love about the 16/8 method is that it’s simple! You fast for 16 hours and feed for 8 hours. For most people, this means you’ll fast through the night and then delay your first meal in the morning until a full 16 hours has passed. A lot of people are too busy to eat in the morning anyway – so simply skip breakfast, and you’ll be a 16/8 fasting pro. This is the most popular feeding window because it’s (almost) completely effortless, which means you’re more likely to stick with it. Improve brain health and memory. Make life easier with a stress-free diet. How many days per week should I fast? With the 16/8 Method, you can fast safely and effectively every day of the week. Of course, you don’t have to adhere to this schedule every single day, especially if you want to ease into intermittent fasting. For example, you could fast every other day, or you could fast during the week and take a break on the weekend. Feel free to switch things up and see what works best for you. How should I exercise for the best fat-loss results? Any sustainable weight loss plan should include a little hard work and sweat to get you the best results possible. When should you train while fasting? For most, the optimal training time when fasting is first thing in the morning when you’re deep in your fast. This is when your “fight or flight” system is on full alert and your body is ready for action – which also means it’s mobilizing and burning fats at an accelerated rate. In addition, your HGH levels are typically highest first thing in the morning, and HGH boosts muscle growth and exercise performance. So, rise, shine, and hit the gym! What type of training should you do? In general, combining both light strength training and cardio is the optimal workout when you’re fasting. So, focus on a high-intensity interval training (HIIT) program, such as the one below (bonus: it takes less than 10 minutes!). What liquids can I consume while fasting? If hunger or low energy gets you down when you’re intermittent fasting, then it’s liquids to the rescue! Not only will they help combat these common problems, some liquids can even make your fast more effective. It's important to note that some liquids can break your fast without you realizing. Read our Liquid hacks that won't break your fast​ article to better understand your choices. Breaking your fast at the end of your 16-hour fasting window may seem simple – you just eat, right? But there are optimal ways to break your fast, especially if you’re trying to shed unwanted pounds. If weight loss is your main goal, then your first small meal should include a combination of protein and fats to extend the fat burning. And here’s my hack for breaking your fast for weight loss: use MCT oil to extend the fat burning even longer. MCT oils contains fatty acids that zoom straight into your bloodstream and signal to your body to keep using fat for fuel. Read this awesome article that covers the secrets to optimally breaking your fast. What diet program should I use when Intermittent Fasting, and should I calculate my macros? If you’re trying to lose weight, I recommend a low carb diet combined with intermittent fasting. This means you’ll avoid eating things like pasta, bread, and super sugary foods. Instead, you’ll focus on proteins and healthy fats. On a low carb diet, your blood sugar will stabilize and the levels of insulin in your body will decrease, which means you store less fat. In addition, your body will turn to fat as its primary fuel source. Eating healthy fats also makes you feel more satisfied and fuller – it doesn’t even feel like dieting! One of the most popular low carb diets is the Ketogenic (or Keto) Diet. This diet is a strict, very low carb diet. But even though it’s strict, it’s still relatively easy to follow. Plus, it gets you in a prime fat-burning state known as ketosis. Lastly, it’s important to track your macros to make sure you get the right balance of protein, fat, and even carbs. This might sound intimidating to some, but trust me, it can be really simple with the right tools – and at the end of this article, I’ll reveal the perfect tool that brings all this together in one easy-to-use app. 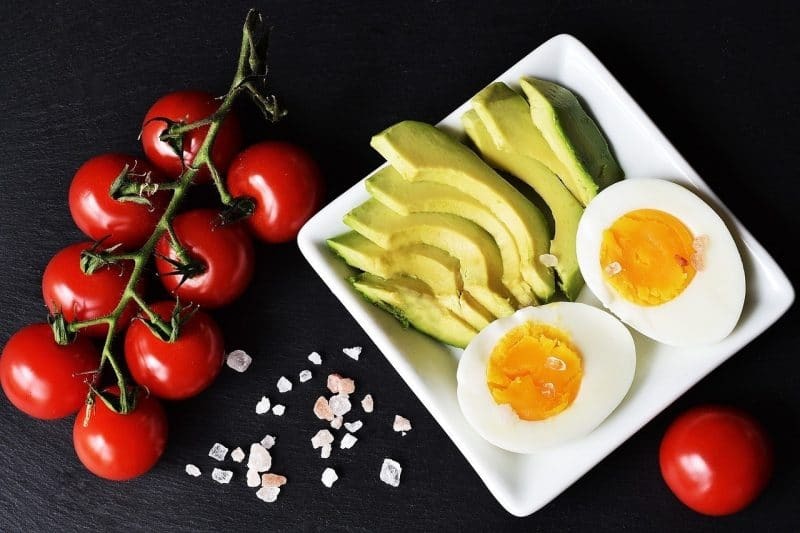 If you’re following a ketogenic diet, you’ll want to avoid most carbs and focus on proteins and fats during your feeding window. No matter what diet you decide to go with, the majority of your meals should be healthy whole foods, which are more filling and have all the nutrients your body needs. Basic, nutritious foods are also easier to digest. In addition, the following foods will help you reach your weight loss goals. When it comes to how often you should eat during your feeding window, there doesn’t appear to be any significant evidence that backs a specific number of meals throughout the day. The most important thing is that you hit your macros within the eating window. Whether you break that into 3 meals or into 6, you should still see results! Now, let’s talk about the best tool to keep you on track with the right foods, calories, and macros. 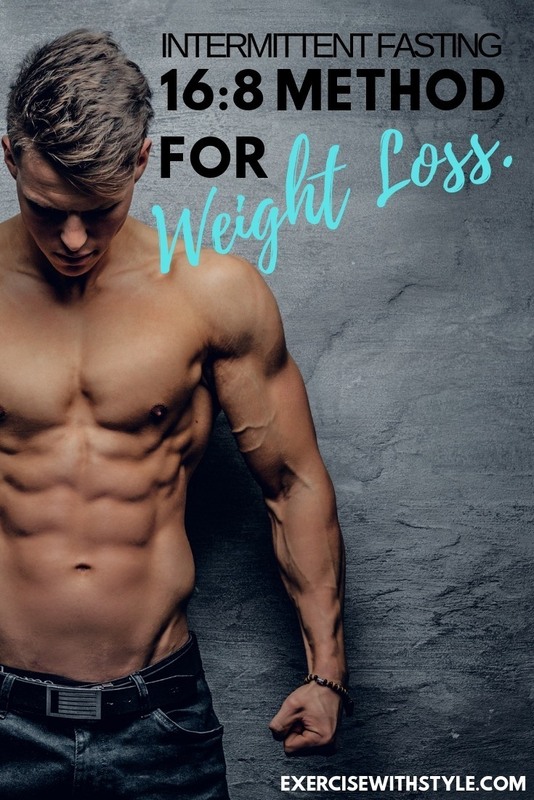 Losing weight doesn’t have to be complicated – especially if you use this secret weapon that basically does all the work for you. 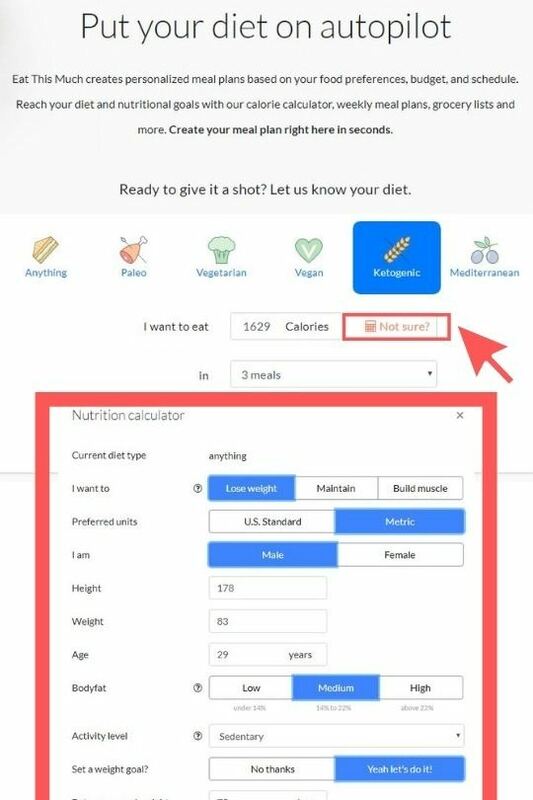 At Eat This Much, you’ll find the free macros calculator and autopilot for your meal plans, (Free Trial Coupon Below) which means maximum weight loss results with minimal effort. The highly-qualified experts at Eat This Much do all the planning and preparing for you. You just enter your goals and preferences, and they send you a weekly grocery list, meal plans, and cooking instructions. It’s like having a personal nutritionist on call 24/7! And yes, Eat This Much has a keto diet option that’s perfectly paired with intermittent fasting for weight loss. Check out the graphic below to get started (yep, that’s easy, too!). Combine intermittent fasting with a low carb, ketogenic diet and watch the magic happen. Did you find this article helpful? Comment below and make sure to hit the share button and let your friends know how they can lose weight with Intermittent Fasting 16:8 method!